Denver, Colorado. September 29, 2014 – NASA and Lockheed Martin have finished fueling the Orion spacecraft with ammonia, hydrazine and high pressure helium at Kennedy Space Center’s Payload Hazardous Servicing Facility. 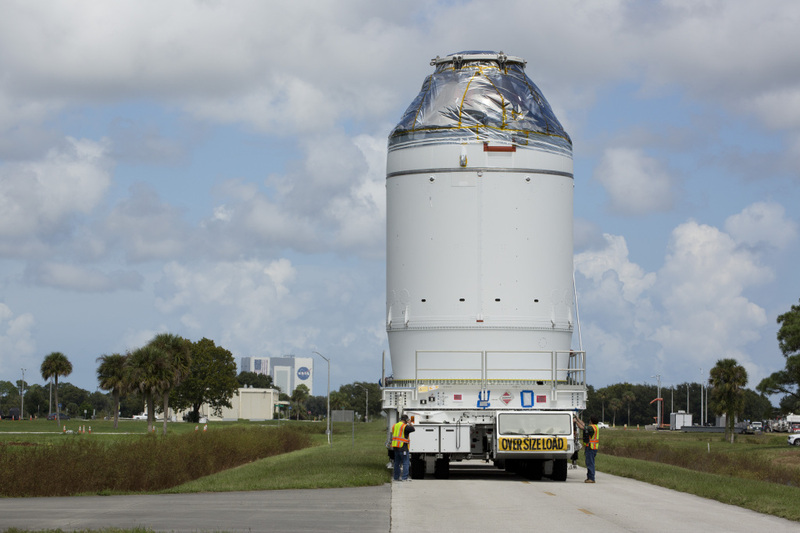 Orion has now been moved to the Launch Abort System Facility for integration with the launch abort system (LAS). Orion’s LAS is a critical launch safety technology designed to immediately pull the capsule and crew out of harm’s way in the event of an emergency. The LAS is the highest thrust and acceleration escape system ever created, significantly improving crew safety from pad operations through ascent. It consists of three solid rocket motors: an attitude control motor, which steers the crew away from the launch vehicle, a jettison motor, which pulls the LAS away from the crew module, and an abort motor, which propels the crew module away from the launch pad. During Exploration Flight Test-1 (EFT-1), targeted for December 4 of this year, all nominal functions, including separation, will be tested on the LAS, but the abort functions will be inactive. The LAS abort functions were previously tested in New Mexico at White Sands Missile Range during Pad Abort Test 1. During EFT-1, the uncrewed spacecraft will launch on a United Launch Alliance Delta IV Heavy rocket and will travel 3,600 miles beyond low Earth orbit—15 times further than the International Space Station. That same day, Orion will return to Earth at a speed of approximately 20,000 mph for a splashdown in the Pacific Ocean.